Find A Trusted Brand In Ayurvedic Medicines And products manufacturing! WHO-GMP Certified Third Party Ayurvedic Products Manufacturer in India! 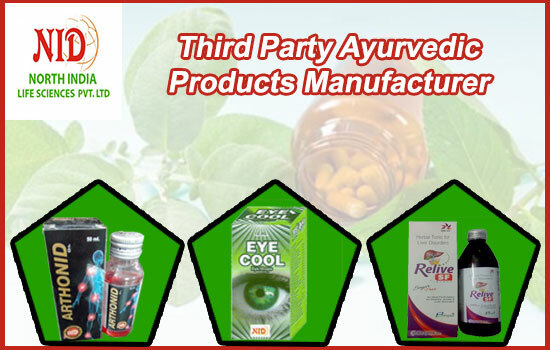 Third Party Manufacturing of Ayurvedic Products – North India Life Sciences is ranked no.1 among various Third Party Ayurvedic Products Manufacturer in India because of its quality and infrastructure. We are certified Ayurvedic third Party manufacturing company in Karnal, Haryana. We are supplying our Ayurvedic third Party products throughout India with the help of our extensive network of distributors. This best Ayurvedic Company in India has a team of professionals who are specialized in manufacturing, customer services, handling sales. We are providing top-notch Ayurvedic medicines to consumers for their wellness, & our products are also available at affordable rates. As a reputed 3rd party ayurvedic products manufacturers & Third Party Manufacturing of Ayurvedic Products, we always take care of quality and ingredients while manufacturing products and medicines and continually work towards fulfilling the specific needs and requirements of our clients. Third Party Manufacturing of Ayurvedic Medicines in India! North India Life Sciences is also specialized in Third Party Manufacturing of Ayurvedic Medicines. As we involved in the production of herbal remedies for Alzheimer disease, anxiety, asthma, cancer, high blood pressure, and cholesterol. And we also manufacture gripe water for children. We’re even producing ayurvedic oil for healing joint pains and muscular pains and also have herbal medicines for immunity boosting. Our products range also includes hair shampoo and herbal body washes which are chemical free. And these herbal products by us are useful for people who are suffering from hair fall. We have an extensive range of ayurvedic medicines including capsules, tablets, syrups, and granules. Being one of the leading Third Party ayurvedic medicines manufacturers in India, we are committed to providing products to consumers who are not meet the requirements but also improve health quality and efficiency. North India Life Sciences have an advanced mechanism for capsule filling, products packing machines, aluminum strip packing machines, and many other mechanical types of equipment to meet the particular requirements of our customers. We have a large stock of raw material, and our production team is expert in manufacturing medicines in short span. Choose us for Ayurvedic Third Party Manufacturing! The government officials certify us for high-quality assurance. Our plants are fully equipped with the latest machinery equipment to fasten and smooth the process of Ayurvedic third Party manufacturing. We have a clinical lab for testing the quality of finished goods. We also have a team of Ayurveda expert lab technicians to check the medicines. The company always conducts a series of scientific verification of our manufactured Third Party Ayurvedic Products to ensure the quality. Our expert lab technicians use advanced technology to check the correct quantity, efficiency, and quality of the herbal medicines. We always follow the rules and regulations implemented by the medical officials. Our company also uses require standards to accomplish quality for delivering good health to our valuable customers. We have an extensive network of distributors and suppliers who are providing our Third Party Manufacturing of Ayurvedic Medicines to the massive amount of consumers. There is a significant demand for our Ayurvedic third Party manufacturing in the consumer market, and we are capable of completing that demand in an efficient manner. We are also offering franchise to individuals or companies that want to earn a significant income by supplying our herbal products. You can also become an essential part of one of the leading Third Party Ayurvedic Products Manufacturer by taking our franchise and get the opportunity to earn good income and profits by serving people for good health and well-being.